Cafe Bacchus is at the end of High Street, and it's one of the only "high-end" restaurants in downtown Morgantown. Because of its price tag, I hadn't tried the restaurant before as a casual dinner. As Brittany and I take on all (never tried before) restaurants in Morgantown, this was next on my checklist. One, because it is so close and two, because I've heard good things. I wanted to like this restaurant; I really did. From the outside, the restaurant looks like a house, and when you first open the door, you basically walk through a curtain. While this probably is supposed to add to the atmosphere, I felt as if it was tacky. We walked a little further, and there was a chalkboard that listed special events coming up (they had one for Martin Luther King, Jr. day), and they took our coats to hang up. Then, we were seated in one dining area. Since it was basically a house, there were various rooms; I counted about four. Each had a different wallpaper/color, but all had white-tableclothed tables, complete with lit candles and black cloth napkins. Our room also happened to have a bar, which looked very nice lit up and stocked to the max. The decor had a very warm, expensive feel. The fireplace next to us was luxurious, and the menu, which I soon found it, had a very expensive feel, as well. Most entrees were at least $25, which I'm okay with. I'm perfectly okay to pay a higher price for a very good meal. Unfortunately, my meal wasn't quite worth the price tag. None of the items seemed like something I would really like, as many had one or two ingredients that I knew I didn't like. However, there was a "striped ravioli stuffed with ricotta, spinach, and sundried-tomato in a pesto sauce" that caught my eye. It was $20. Perfect, I thought. I ordered that, and while we waited, we were served bread (which we ended up having about two or three bowls of), along with minced olive and butter. Brittany decided on a salad and "Vietnamese rice paper rolls filled with jump shrimp, cucumber sambal and mint serviced with spicy ginger lime dipping sauce." When my dish came out, I was disappointed in the total of nine raviolis. While they were tasty, with typical ricotta and spinach stuffing, I was still hungry after my dish. That is not my idea of a $20 meal. The seasoning was on par, salty spinach and smooth, creamy mozzarella and ricotta cheese. The mixture complemented the different seasonings, and the pesto sauce was very creamy and added a hint of sweetness to the dish. In fact, I was still so hungry after the meal, I used some of the bread slices to dip in the leftover pesto sauce, which is where the extra baskets of bread came into play. Brittany wasn't too pleased with her dinner, though her salad was tasty, she couldn't really get over the texture of the rice paper rolls. Honestly, it's nothing that I couldn't have got at a typical Italian restaurant (a la Olive Garden) for at least $10 less. I won't deny the food was tasty, but it wasn't $20 tasty, and I feel I could even make it. The menu seemed as though the chef was trying too hard to be different. He had eclectic sense of flavors, but instead of finding out how they all taste together, they are just fused together, so it sounds like they should be good. But as far as the actual taste goes (as in Brittany's meal), they just didn't mesh. Sure, they sound good, but tasting good is very important. Well, at least to normal patrons, and not the usual Cafe Bacchus goers who probably like the "status" of the restaurant. The only redeeming factor of the meal was dessert: vanilla bean cheesecake with a walnut crust. Otherwise, this dinner would have probably been a "D." The cheesecake was silky smooth and had a very New York-style, with a prominent cream cheese flavor. The walnut crust had actual crushed walnuts that just crumbled as soon as my fork hit it. It was definitely homemade, and a decent-sized portion. For only $7, I should've made my "dinner" of just cheesecake and had a more pleasant meal. Luckily, my company was top-notch, as always, so I still had a splendid time. Had it been with someone else, this restaurant might not have been so lucky. First of all, unless you ate one, you received 8 ravioli, not 9. Second, the presentation of your entree is subpar; a big puddle of sauce on the rim of your plate is unacceptable. 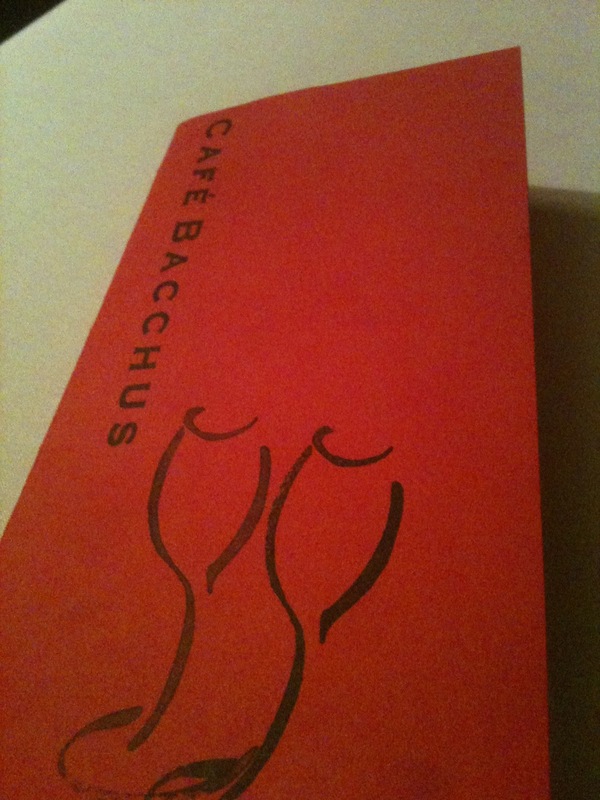 I enjoyed this review, and will be crossing Cafe Bacchus off of my list of restaurants to visit. You're right - looks like 8! I definitely think you should try this restaurant again. We've eaten there several times, and I've never had anything bad. The pork chops are probably the best I've ever tasted. I don't think we've ever actually ordered off the menu. We always get one of the specials. The salmon is always to die for, and my favorite was a few falls ago when they featured a chicken dish with a butternut squash sauce, with chunks of squash in a really yummy gravy. I definitely look forward to seeing your redemption review. If you like pork chops, I definitely recommend you try one! The owner contacted me, and though she didn't necessarily invite me back, she did note that I probably didn't get the full feel. I definitely want to check it out again. I love squash - that sounds amazing. I'll try to get there as soon as I can! Thanks for your comment!